"I will never dress my kids in matchy match anything for photos"
I always had it in the back of my head that Julia and Sebastian started school, "sometime in late August" and never gave it a second thought until yesterday when I decided to bust out the old calendar and oh - school starts THIS WEEK. Commence flurry of serious back to school shopping which will not include footwear because I've already got that very much covered thanks to Rack Room Shoes (kind post sponsor!). I've written about them a few times before because we are such a fan as a family and ALL have Rack Room Shoes in our closets because the prices and selection can't be beat. Rack Room carries brands that parents and students love: Converse (pictured, obviously), Vans, Skechers, Nike, New Balance, and so much more. I'm a huge fan of these Converse Shorelines (Sebastian had a pair before and loved them) because the back is elastic and the laces don't need to be tied and so the three older kids can put them on THEMSELVES which is a game changer in the mornings - as many of you know, I'm sure. Phoebe loves loves LOVES to match Julia and so you can imagine how she almost lost her mind when she saw that allll the kids were matching (little kids in Converse Allstar Lo's) and she kept chanting, "match! match! match! MATCH!!" for all of the Greater Tampa Metropolitan Area to hear and enjoy at a rather early hour of the morning. Bosco and his Olympic inspired gymnast aspirations were thrilled too. Rack Room Shoes has a phenomenal Shoes That Fit campaign that donates shoes to kids in need. Shoppers can donate to the cause at checkout and be confident that 100% of your donation will go directly to the cause. Rack Room Shoes is generously giving away a $100 credit to one lucky reader today. You know the Rafflecopter road well by now -- best of luck! Asics running shoes! Been needing a new pair!! Absolutely in love with the Keds t-straps for my girls. A gift card would definitely go towards purchasing a matching pair for them! They stay on - love them! I need some new running shoes, but I really like the sketchers sneakers for little girls! I'm dying to get some Converse for Kate for the exact same reasons you mentioned -- she's OBSESSED with shoes and ones that she can put on herself literally occupy her time for hours. Yep. We need kindergarten shoes up in here. I'm loving the idea of anything Kate can put on herself (but can't be open toed)! Secretly love matchy match things! I need some new booties for fall, looks like they have a great selection! I'd love to try those converses for my 3 year old! And some Nike 6 trainers for me. I would love for my girl to be able to put them on herself! They are adorable. These are gorgeous photos. And I didn't know about the shorelines with the elastic - my kids would love them! I really love the white Converse that your children are wearing! I tried to get my oldest to pick out those exact color and style last school year but he went for the hightop gray style and eventually regretted his decision when it came time to put his shoes on so I would definitely go for Converse Shorelines! All of our favorites! Gotta check them out! I'm always looking for places to get non bright pink girls shoes, thanks for the recommendation! I'm always on the look out for cute toddler shoes! They grow out of them in a hot minute so it's a constant struggle. i really need to hop on the converse wagon - so cute! Bosco's little legs and feet in those converses are too much!! My child needs some now, too!!! I love my Converse Shorelines. I have a navy pair, and I'd love to have a white pair too! I am pretty sure my son needs those converse! I like the converses your kids are wearing! So cute! I need new work shoes! I'd love to get some matching converses for my little girl and baby #2. CL has some cute peep toe black patent wedges! I just started a new job- I need back to work shoes! Thanks for hosting! I can buy new shoes for myself, right? The kids have grandparents to buy theirs! Ha! I think I'd get some new boots. I'd love to get matching Converse for my two kiddos - I'm a huge Converse fan. Look how big sebastian and theo's feet are!! When everybody matches like that- how do you keep track of whose shoes are whose? My little lad is starting soccer soon, so I'd totally get the Adidas soccer cleats. Would love some new boots for the fall/winter!! Thanks for the great giveaway! I like the CLARKS AVALEEN LAKE wedge. Oooh I would absolutely get the Converse double tongue watercolor! Converse, all the converse. My son is *just* about to outgrow his first pair and I'm eyeing the gray ox ones. I'd love some fall boots for my daughter. I matching white chucks for my daughter and I, would love to get another pair for our littles girl! My 13 year old son is addicted to sneakers. Nike! Converse! All the shoes, please. oh I've never heard of these converse shorelines. I def have to get those for my kids!! I love the Converse shoes your kiddos are wearing. My younger boys may need them, too . . .
LOVE my Shorelines!!!! Thanks Grace! I could use some canvas less for the fall season. Converse are my all-time favorite sneakers, and I've been eyeing a pair of Shorelines. 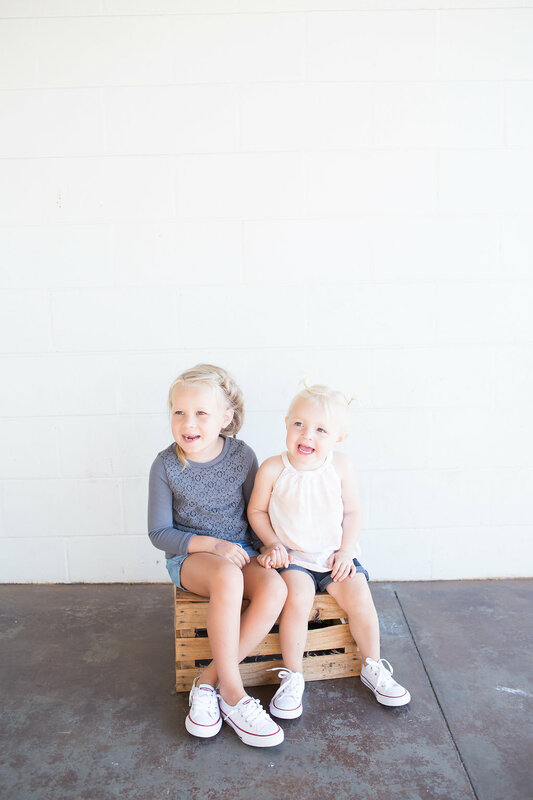 Your kids look adorable in them! Definitely the Converse for all three of my kids! They go with everything! My child is busting through shoe sizes so I would probably snag a new pair of Nike Flex for him this Fall! Vans for the girls...because man do their feet grow fast. I have just revised my stance on matching with my own child and am so ready to go full Motherboy with matching shoes. I'm loving the Vans Rowan for myself. BTS present for momma! love them! hopefully some baby boy and dad matching shoes in our future! Women's shoes too! Uh oh. Love the matching converse...maybe that would make hand-me-downs a little less "traumatic". Although I am quickly getting to he point where shoes are trashed beyond hand me down capability....I don't think they know how to use the swings without dragging their toes on the ground! With school starting, my 4 oldest need a pair of sneakers to leave in their lockers. I will most likely letting them pick based on favorite colors . Since my 2nd oldest is only 1/2 a size away from me though I'm hoping to steer her towards some cute ones I can steal as well. I'm loving some of the bright colored Asics . Would love a new pair of New Balance running shoes... So many to choose from! I've always wanted a pair of converse for myself! I would LOVE to get both my speedy toddlers some Nike Flex! 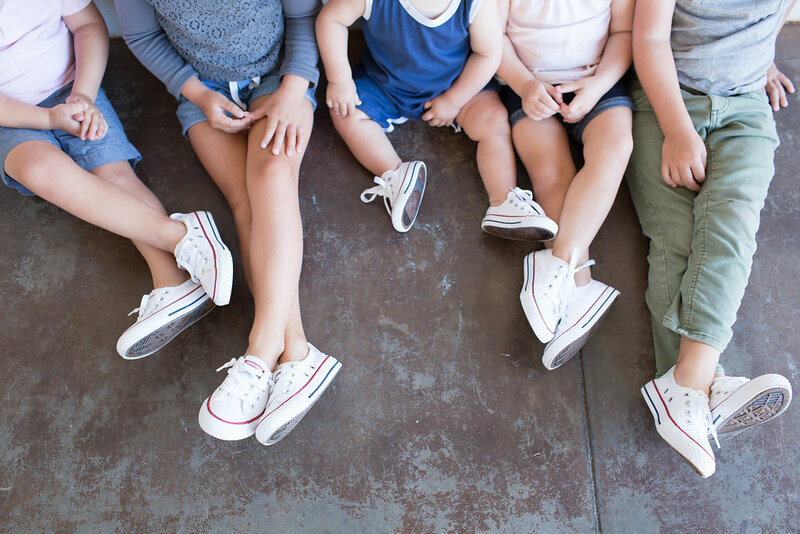 We're a Converse family too! All three of my boys would look great in the Sperry Ollie Jr! Such cute photos! I have to say, I would love a pair of the Converse Shoreline. But it looks like my 8 month old will be walking soon so I've gotta get some shoes for her too! Those converse with elastic for my my 5 year old girl starting kindergarten would be a dream for her!! My kids suddenly grew out of every pair of shoes that I packed for our year in Rome. Help, Grace! A pair of black Rachel Lindsey shoes for my littlest girl plus some converse for middle son. Thank you! A new pair of Sketchers Go walk Slip ons or some converse for my lil dude! I would love to finally dive into the world of booties finally and also snag some nikes for my first grader. 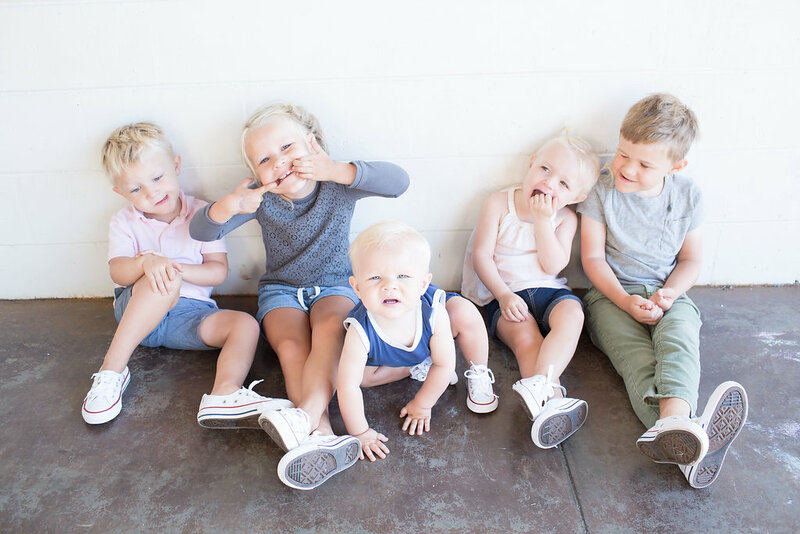 I have 6 kids, would love some new shoes for them! Love your blog. God bless. I would buy myself the BOC Mary Janes because I need something other than sneakers to wear with pants! I love back to school shopping and cannot wait to take my child to multiple stores to try on shoes and clothes....said no mom ever. I shall win I think. Hi! This is super detailed, but are some of the kids' shoes knotted? It looks like knots instead of loops. I see Julia has the cute side knots, but I was looking at the photo of the boys and it looks like the two older ones are knotted. Curious if there is a trick here to get them undone easily? My mom uses an old trick to do a way that looks exactly like the loops, but it keeps them from coming undone because it's similar to a knot, but looks normal. Somebody in my house always needs new shoes! Very very cool about the donations for other kids, that is awesome! I need some new black work shoes, so I might have to be boring and go with the XAPPEAL DAFFODIL. 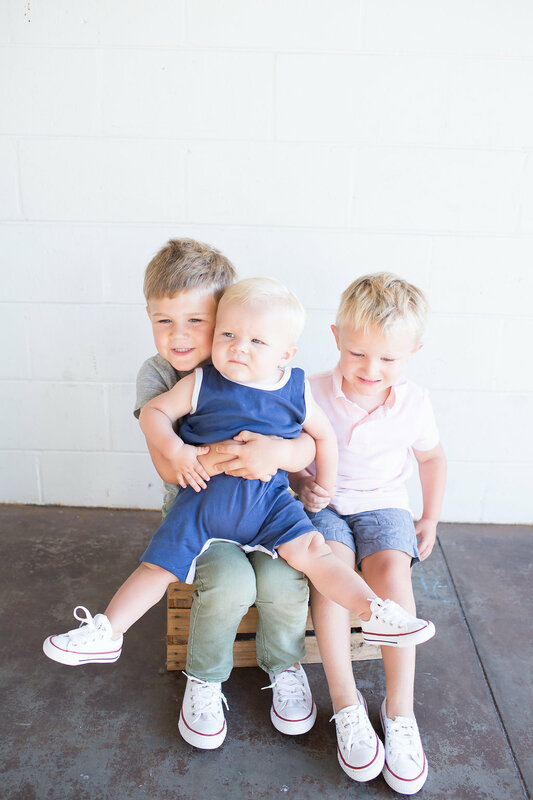 My boys are out growing shoes at an alarming rate and would love some new Sketchers! I would love love love to get some awesome matching converse for my toddler and I. So cute! The Vans Asher V Checkers are so adorable! I'd love to get a pair. Boots (wit da furrrr)!! :) I'm shamefully ready for fall. I love the BEARPAW BOSHIE - they are as cute as kid's uggs, but much less expensive! Your description of the Shorelines is exactly what I've been looking for! And I'm pretty sure the cutie sitting in front of us at Mass yesterday was wearing them and I've been thinking about them ever since! Crossing my fingers! my kids need shoes badly! Any of the Nike Flex for my son and daughter, and the Chinese Laundry Sequoia Booties for me!! I love their Dr. Scholl's Codi booties! yeah, I'd be totally selfish and get myself a pair of the XAPPEAL ADELE boots! My oldest needs new dress shoes, so it would be great to snag the CUPCAKE COUTURE CHARISE shoes. I would probably get some shorelines for me and a pair of nike flex experience for one of my little ones. I literally just tried on a pair of shorelines yesterday for myself (because CUTE) and I've been wanting to try and squish my toddler's wide feet into some matching converse! Need to get ourselves to Rack Room asap. My daughter would love a pair of "real" Converse shoes instead of our typical off brand! My kids love Converse and Vans! Love the converse! I've been wanting to get my boys each a pair! Those converse slip ins sound like a must have!!! Oh man, I love the Converse! I would choose those! I think I'd get my toddler some Chuck Taylor Oxs in gray (and maybe a pair or two for his mama too). I'd love a few new pairs of shoes! Easy choice - those converse shorelines are cute and genius! My children obviously need shorelines. New flats for me, or new tennis shoes for my toddler (bonus if he can put them on-I might try the converse!). I love the Oshkosh shoes but man your kids make the converse look so cute! Rack Room miiight be my new obsession. I'd love the hunter boots! Any of the Skechers shoes that light up for my kiddos, they drool over every commercial that they see! Tough call! So many great brands and options...I think maybe some Sperrys or Birkenstock Mayaris. Both my kiddos need sneakers! Curious about Vans for toddlers. love the look of those matching converse! so adorable!! My daughter would love the Converse. 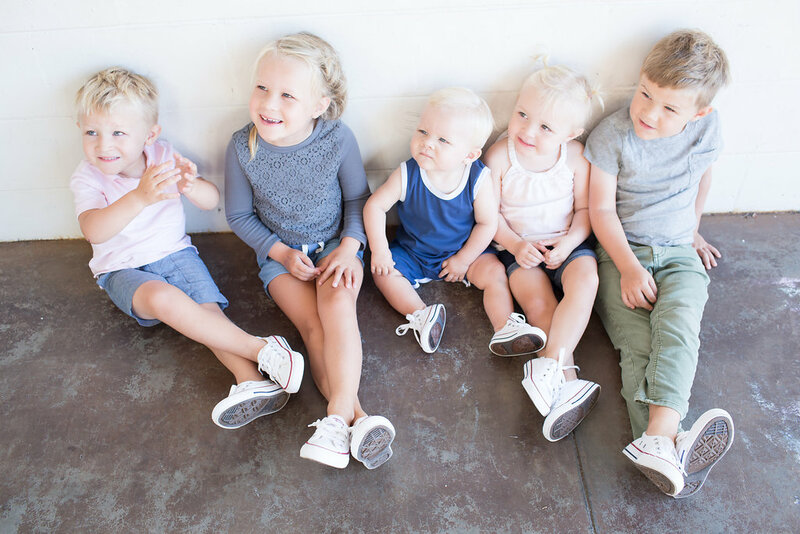 Ooooh I'd love the shoreline converse for myself, and I absolutely adore all five of your kiddos in them! The converse are too cute. I'm looking for new shoes for my daughter and this would be a great win! Love them in all matching shoes! I'm pretty sure my kids would die of happiness if I got them matching shoes. But really, I'm in desperate need of a new pair of New Balance running shoes and some Keds slip-on sneakers. Limelight booties for me, and rainboots for my toddler! Win, win! I really need some rain boots- maybe the Sperrys. I'm too cheap to splurge onshoes these days (SAHM shopping guilt is real, people. ), but if I were less ridiculous, I'd definitely splurge on shoes for me too! My littles would love matching shoes! who knew they could get even cuter! love the matching. got my eyes on some rack room nikes! Love shoes that kids can put on themselves! I think I would have to get a pair of shoreline converse for myself. I always buy my kids converse because a) unisex and b) they wash up so well. I've been eyeing the shoreline but was skeptical theyd stay on while Luke ran...do they??? Would love to try the shorelines! Love those shoreline converse. my two year old needs them! For sure some Converse Shorelines!! I've been wanting a pair! Also in desperate need for some fall booties this year! Love the idea of a slip on but still with laces! I'd love some converse or new workout shoes! So cute! I'd love to get converse shoes like that for my toddler. I'd love to get my little sweetie TOMS-I think they are the cutest!! Converse! But maybe navy for the boys? I'd get some converse, too! I love my shorelines and would love to match my kiddos! Ugh. So classic. I smell a Christmas card photo! Totally agree about the matching, but matching converse are totally an exception!! I've been thinking of getting a pair of Converse Shorelines for awhile now, for myself and/or the kids. After seeing these pictures, now I really want to! I'm loving the Clarks Helio Jet wedges! I am need of new running shoes so badly, love their selection of Asics! Non tie converse?! I had no idea such a thing existed! We need some asap! I'm a teacher, and I'm headed back to school this week too! I am always looking for comfortable footwear, and the Chuck Taylor All Star would probably do the trick. I might also buy my budding walker (9 months) her first pair of shoes! Need some new booties for fall!! A new pair of new balances! Mine are shot. Madden Girl boleros for fall! Oh my goodness, it's all just too cute!! My two munchkins need new shoes so this would be just perfect! I've been looking for a nice pair of wedges. I like a pair of Clarks (Helio Float) that I see online! I'd try to snag shoes for a couple of kiddos- back to school! ok HOLD EVERYTHING. in that last photo, did the photographer ask for funny faces? and did Theo and Bash make the exact same funny face, in mirrored versions? and for Phoebe's funny face is Phoebe breathing on her nails to then polish them suavely against the shoulder of her shirt? BEST KIDS. EVER. 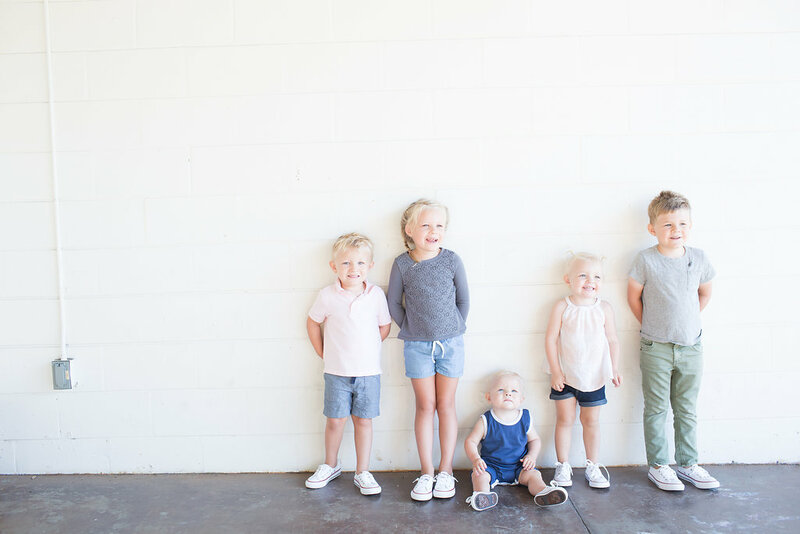 Definitely need tennis shoes for the whole fam...especially the Velcro ones for the littlest feet! I need to find some shoes that my 4 yr old can put on and take off by himself. I have been wanting a pair of chucks for my daughter forever so converse for us! Some toddler Nike downshifters for my little guy. I always buy my kids' shoes at Rack Room. You just can't beat buy one get one half off! Love the shorelines! The Keds t-straps are adorable, too. They look like Prince George's shoes! Mom of 5 here as well but mine are in another season. The babies are in high school, other 3 on their own. Oh, it truly does go by fast.